Verint� Nextiva� is the industry�s most comprehensive, integrated networked video portfolio � a single source for virtually every facet of your video security operations. � Intelligent network video recorders designed for real-world applications, from ATM kiosks and convenience stores to the on-board environments of buses and trains. Nextiva�s integrated video analytics rapidly detect significant activity in vast amounts of video and data for faster, more effective action. Available on board many Nextiva edge devices, Nextiva video analytics provider superior analytic accuracy with lower bandwidth, server, and storage requirements. 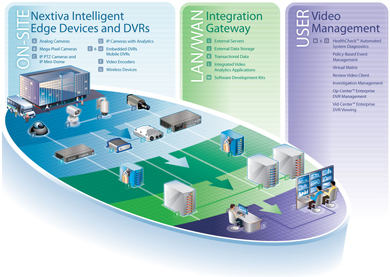 Nextiva�s robust video management software promotes more manageable and effective video operations, with automated system health monitoring and diagnostics, live and recorded video viewing, policy-based video distribution, efficient virtual matrix switching, versatile investigation management capabilities, enterprise DVR management, and enterprise DVR viewing. Nextiva vertical market suites for critical infrastructure, mass transit, retail, and banking address industry-specific challenges and deliver excellent business value. Nextiva lowers cost of ownership, adds value to existing CCTV investments, and eases migration to IP video operations. Nextiva adds value to your existing enterprise investments. Nextiva is designed for systems of virtually any size and is highly scalable. Nextiva can support just about any number of locations, so that you can readily expand your video operations. Nextiva leverages commercially available network, server, and storage solutions, so you can continue to use the systems in which you have already invested and the vendors who offer you optimum value. And Nextiva supports hybrid analog/digital environments, so you can experience the benefits of IP video using your existing analog equipment. Nextiva promotes more cost-effective and reliable operations. Nextiva optimizes use of valuable network resources, with flexible video compression, dynamic bandwidth allocation, and dual streaming capabilities. Nextiva�s sophisticated storage management enables you to leverage enterprise storage infrastructures and off-the-shelf storage solutions, with flexible retention and the redundancy, fault tolerance, and continuous storage monitoring essential to ensuring image availability. Nextiva enhances interoperability with enterprise systems. Nextiva is standards based and IT friendly, and our packaged integrations and software interfaces facilitate interoperability with your IT, security, and business systems (access control, command and control, Point of Sale, etc.). Nextiva interoperability streamlines deployment and reduces implementation and operational costs. It also facilitates the flow of information among your enterprise systems, for greater situational awareness and more effective response. Verint is dedicated to delivering optimum value with every Nextiva deployment. Verint partners play an important role in providing our customers with rapid implementations, superior performance, and maximum return on investment. And our industry-leading Customer Support Programs reduce the complexity of supporting advanced IP video systems, with programs to suit a variety of requirements and budgets. Contact us for more information.